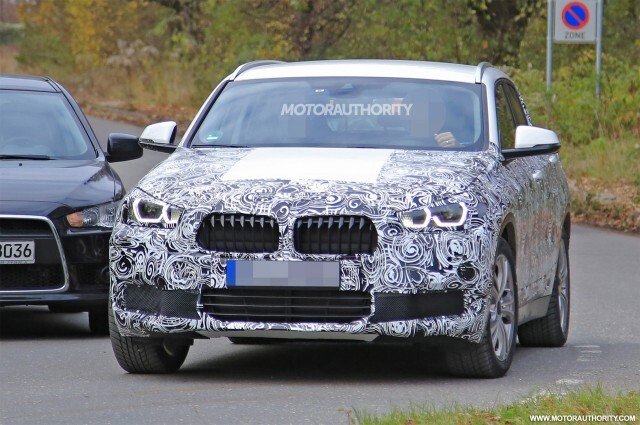 No longer the subject of rumors, BMW’s new X2 continues to take shape ahead of its debut in 2017. We were given a taste of the design with the unveiling of the X2 concept at the 2016 Paris auto show. The aggressive lines of the concept will be toned down for production but the basic shape should remain the same. For the uninitiated, the X2 is a compact SUV with coupe-like styling that’s expected for the 2018 model year. It’s derived from the X1, just as the X4 is derived from the X3 and the X6—the original coupe-like SUV—from the X5. The design is much more aggressive than on any of BMW’s existing coupe-like SUVs. It has a very low roofline and subsequently the windows are all rather short. The design most closely resembles that of the Range Rover Evoque from Land Rover. The front also has a very low, wide stance. Engine options should be shared with the BMW X1, which for the United States will mean a turbocharged 2.0-liter inline-4 fitted as standard. This should enable the X2 to accelerate from 0-60 mph in a little over 6.0 seconds and reach a top speed of 130 mph. The platform underpinning the X2 is the same front-wheel-drive-derived UKL structure found in the X1, plus the latest Minis. The UKL structure is designed for transverse-mounted engines and offers the choice of front- or all-wheel-drive configurations. We could eventually see up to seven UKL-based BMWs at some point. Some of the other variants are thought to be the next-generation 1-Series Hatchback and perhaps even a new Z2 roadster. Ep. 70: Is a Sony Mirrorless Medium Format System Coming?